Review posted August 7, 2017. Clarion Books (Houghton Mifflin Harcourt), April 4, 2017. 338 pages. Sarah Beth Durst is so imaginative! I have to say that as a rule, the creatures her characters befriend and ride on are generally exceptionally cuddly. I'm thinking of the bear in Ice and the tiger in Enchanted Ivy, but now also the winged lion in Journey Across the Hidden Islands. This one's a middle grade adventure about twelve-year-old twin princesses. Seika is the heir to the emperor of the Hidden Islands. And Ji-Lin will be her sister's imperial guard, along with her winged lion companion, Alejan. 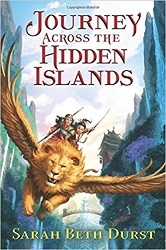 Ji-Lin and Seika are still in training, but somewhat to their surprise, on their twelfth birthday, they are told they are ready to go on the Emperor's Journey. Every generation, the emperor's heir journeys across the hundred islands and renews our bargain with the dragon, ensuring the continuation of the barrier for another generation. The heir travels only with her or his brother or sister and one winged lion, as Himitsu himself did long ago. The barrier that the dragon maintains keeps the islands safe from the koji (monsters) on the outside. But as Ji-Lin, Seika, and Alejan travel, they encounter koji where they shouldn't be. They find the journey much more difficult than it should be, and other unexpected surprises in what's supposed to be carefully planned. Is the barrier already falling? What if they fail in their quest? What will happen to their people? Along the way during this adventure, there are wonderful details of this magical world, including mer-minnows, waterhorses, and unicorns. I like the interaction between the sisters, and the character of Alejan - obviously a young winged lion, and one who's always hungry. This is an excellent adventure for middle grade readers. And who wouldn't want to fly on the back of a lion?